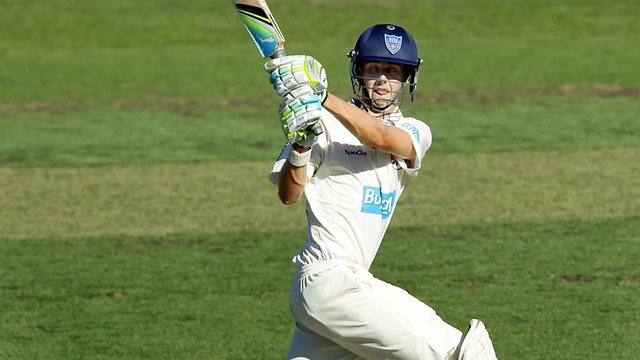 1) He was the leading taker in the Sheffield Shield last season. 2) The debarkle that was the India tour showed that qality Oz spinners would appear to be in short supply. 3) The selectors realized that they hadn't quite exhausted their options from NSW. We'll definitely see him used as the second spinner in this series, and possibly again for the Sydney Test. Lyon, Smith & O'Keefe will give Clarke loads of spin bowling options when they're all on deck. He's a decent bat too, with a first class average of 35. I am a bit surprised we haven't seen him feature more in the short stuff, his 7 T20I's yielded some good numbers. Is it possible that his face just did not fit? I mean look at the players they tried before him? Clarke out for the OD series against Pakistan. Some very informative posts about potential Aussie selections but no mention of John Hastings in any posts. Is he nowhere in the frame at all? Shane Watson has once again opened that gaping hole under his nose by suggesting that he plays at his best when he opens the batting. Sigh. Can't see him dislodging either Warner or Rogers... or anybody else right now. I really don't know why Twatto persists with this talk, when he belongs at 6 in the current set-up... where he should have been playing all along. Going forward, I see the number 6 slot being contested between Mitchell Marsh and Glenn Maxwell, and possibly also James Faulkner. He has had his moments has Shane, some of them truly spectacular, but I'll be quietly glad to see the back of him. Too many injuries, too little return for the chances he's been given and a permanent air of lingering discontent mean he's been very much a double edged sword for us. There comes a time when you just have to accept it hasn't really worked as well as it might have done and start to focus elsewhere. This is not the time for the player in question to utter anything other than his willingness to do whatever his team needs of him should he be selected. Shane should temper his expectations and be glad with what he gets. The product has been on the shelves for some time and is near it's 'use by' date. I couldn't have put it better myself. I'd go as far as saying that just maybe Shane Watson has already played his last Test. I really do hope that Mitchell Marsh comes through, even though I still think that he isn't ready. Should Marsh not make the first Test against Pakistan, I really do hope that the selectors go with James Faulkner, as Maxwell is likely to come in for Clarke (although if I had my way, I'd be calling up Chris Lynn as cover for Clarke). As for Twatto, should he get himself back to full fitness over the summer, he still has a role to play in the short stuff, but in Tests, surely it's time to move on. from_the_stands wrote: Shane Watson has once again opened that gaping hole under his nose by suggesting that he plays at his best when he opens the batting. Sigh. Can't see him dislodging either Warner or Rogers... or anybody else right now. Not a thing to disagree with in this post. The P76 only wants to open for two reasons (imo): to (mostly) avoid the spinners and there is more limelight for him. Apparently he is a lovely bloke (a workmate is the mum of Adam Griffith, and the two of them were housemates and mates during his time in the Tassie lineup - she became his mum-away-from-home), but he has never come across in the media as anything other than selfish and a little thick. Chris Lynn is an interesting suggestion. He was doing great things last year, but the media never really got on his bandwagon. I expect he will be introduced to Aus colours in the shorter versions though - as well as the fact he has recently had shoulder surgery, and I think he is still on the recovery list. As I said in another thread: I reckon it will be Hughes for Clarke, and I hope Faulkner if Marsh is not fit. If they play a second spinner (it looks like O'Keefe), is he there in place of a seamer? Andrew McDonald is back in circulation, turning out for the Redbacks in the One Say Cup for South Australia against Tassie. I'm watching this on the telly. He's just registered a 50 opening the batting with Travis Head, and looks as good as I've ever seen him play. He looks sharp, has played some stylish shots all over the ground, and is scoring at around 120, looking as cool as a cucumber in the process. His chance of adding to his 4 Tests would appear to be remote, with Twatto still hanging in there, and Mitch "the man of the moment" Marsh about to get his big chance in Twatto's absence, and I guess Moises Henriques next in the pecking order. Head looks very impressive too. He seems to hit a lot of balls in the air, some of which have sailed over the fence. I reckon he's definitely one to keep an eye on. Tassie have a decent bowling attack, but these two are making them look like a club. I know you like him (and he IS a ranga), fts, but I have always viewed McDonald's test career in the same vein as Lleyton Hewitt's spell as No1 tennis player - just a gap inbetween the wane of one champ's career and the growth in the next's. I think Henriques tore a calf muscle the other day, but I reckon that, given everyone is at full fitness, the pecking order for alrounder test spot would currently go something like: Marsh, Watson, Faulkner, Henriques before a glance around the traps. I forgot about Faulkner. Yeah with him running around, I guess Ronnie becomes yet another victimized Victorian who was shockingly denied a prosperous international career by a bunch of muppets who call themselves our national selectors. from_the_stands wrote: Head looks very impressive too. He seems to hit a lot of balls in the air, some of which have sailed over the fence. Watching the highlights from most of the games on Youtube, there seems to be a general habit of hitting the ball in the air across Australian cricket. It's significantly more prevelent than it is in the English limited overs game, Australia are a much better limited overs side than England. Maybe there is some link between the two. I've been thinking about this. I do agree and suggest that the reason why this is probably the case is because cricket grounds throughout Australia at every level will be bigger than those in England, so I guess larger spaces in which to hit the ball... perhaps. I think also that there is a strong desire for batsmen over here wanting to get on top of bowlers by dominating them rather than boring them to death. Kurtis Patterson, on of my players to keep an eye on, is currently 120 not out in the Shield match against Queensland. This is his second first class century. He's been batting at 4 or 5 for NSW this season, so obviously they think he's a bit special to be batting there. I thought he was out of his depth last season for a little while, but that no longer seems the case. A few more big scores from him this summer might just see the 21 year old with a better first class batting average than Mitchell Marsh might just see him get a gig in an Australia A fixture at some point. Watch this space. from_the_stands wrote: I think also that there is a strong desire for batsmen over here wanting to get on top of bowlers by dominating them rather than boring them to death. I think a lot of that is down to the new bonus point system that CA have pout in lace for the Sheffield Shield this year. No first innings points, but points awarded for the speed they score runs/take wickets.